End of 2014 is coming, the Grand Hotel Leveque and the rue Cler located 20 minutes away from the Champs Elysées are waiting for you to finish the year in style: Don't wait to reserve : www.hotel-leveque.com The spectacular Christmas illuminations in Paris are an eagerly-awaited event for tourists as well as Parisians. The magical colours of the seasonal street decorations create a dazzling sight for visitors from all over the world. Luminous arches, multi-coloured bulbs, incandescent flames and sparkling projections of light deck out the avenues of the French capital in festive splendour. More than ever, Paris lives up to its name ‘City of Light’! 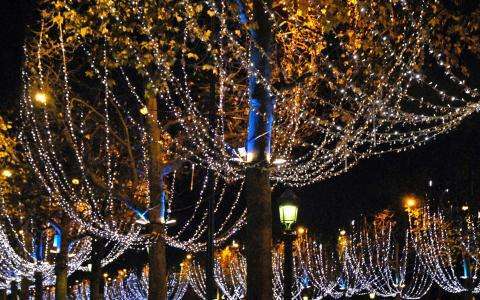 From November to the beginning of January, the Christmas illuminations on the avenue des Champs-Elysées, on avenue Montaigne, in Place Vendôme, the Montmartre district, Bercy Village and in many other places across the city make Paris more magical than ever! The ‘Illuminations of Paris’ sightseeing coach tour, organized by Paris Cityvision, is an invitation to discover Paris’s finest monuments illuminatedat nightfall. This festive tour with commentary in 11 languages can be followed by an unforgettable evening at the Moulin Rouge cabaret.